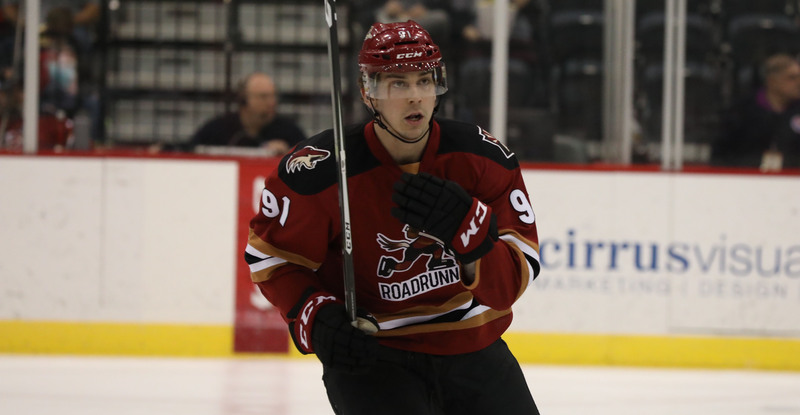 GLENDALE, ARIZONA – Arizona Coyotes President of Hockey Operations and General Manager John Chayka announced today that the Coyotes have recalled center Dylan Strome and defenseman Trevor Murphy from the Tucson Roadrunners, the Coyotes’ American Hockey League (AHL) affiliate, and reassigned defenseman Jalen Smereck to the Roadrunners from the Flint Firebirds of the Ontario Hockey League. The Coyotes also announced that defenseman Jason Demers has suffered an upper body injury and will be out of the lineup for the remainder of the season. The 21-year-old Strome has registered 22-28-50 and 24 penalty minutes (PIM) in 47 games with Tucson this season. He has also scored nine power-play goals (PPGs) and three game-winning goals (GWGs). The 6-foot-3, 200-pound Strome is tied for first on the team in goals and points. He ranks second among AHL rookies in points, is tied for second in goals and is fourth in assists. The Mississauga, ON native was selected to participate in the 2018 AHL All-Star Game earlier this season. The 22-year-old Murphy has recorded 9-21-30 and 71 PIM in 56 games with the Roadrunners and Milwaukee Admirals (AHL) this season. The 5-foot-11, 186-pound native of Windsor, ON has registered 32-63-95 in 190 career AHL games with Milwaukee and Tucson. The 21-year-old Smereck recorded 10-24-34 and 54 penalty minutes (PIM) in 46 games with Flint this season. The 6-foot, 190-pound native of Detroit, MI also dressed in two games with the Roadrunners earlier this season. Demers has registered 6-14-20 and 37 PIM in 69 games with the Coyotes this season.